I’m not sure what exactly possessed me to set to work on a recipe for Angel Food Cake. Maybe its light, airiness seemed right for summer? Maybe…. Okay, I’d come up with other “maybe”s, but truly I have no idea. Once I got it in my head, however, it stuck. And I’m glad it did. As a starting point for the recipe, I turned to none other than Alton Brown. The guy knows his stuff, and the things I’ve learned from watching and reading AB inform everything I bake today. I may have said this here before, but this book taught me nearly everything I know. I firmly believe that understanding baking the way he explains it (visually, scientifically) is the reason I’ve had such success in creating gluten-free recipes. The cake came out beautifully on the first try—though I did tweak a few things to make it even better the second time around. 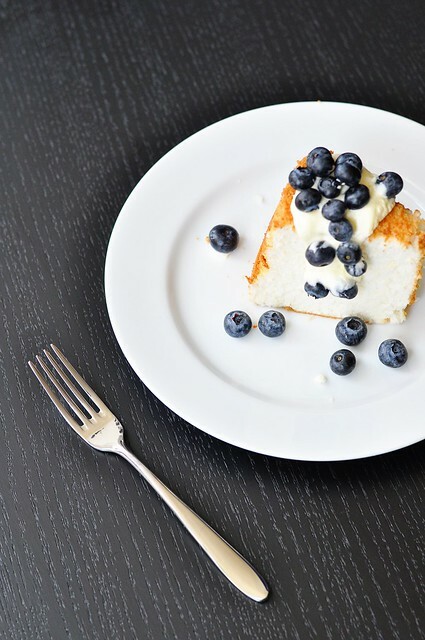 And having made it twice in one week, I can tell you that Angel Food Cake takes a little bit of patience…and upper body strength. Don’t be mistaken, it’s not a difficult thing to put together. It’s just that it takes some time to beat a dozen egg whites* just shy of stiff, and that in combination with the very, very gradual folding in of the flours may have your shoulders protesting. But, having made it twice, I can also tell you that it’s totally worth the effort. This cake is a delicate, spongy thing that practically melts away on your tongue. It tears apart in fluffy chunks, moist and cloud-like. 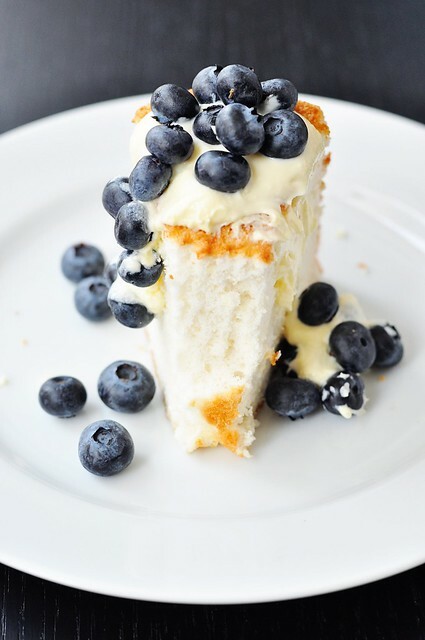 Chris and I like to cut its characteristic sweetness with a bit of tangy crème fraiche or unsweetened whipped cream, but it’s perfectly good on its own. That said, a tumble of ripe berries is always welcome. 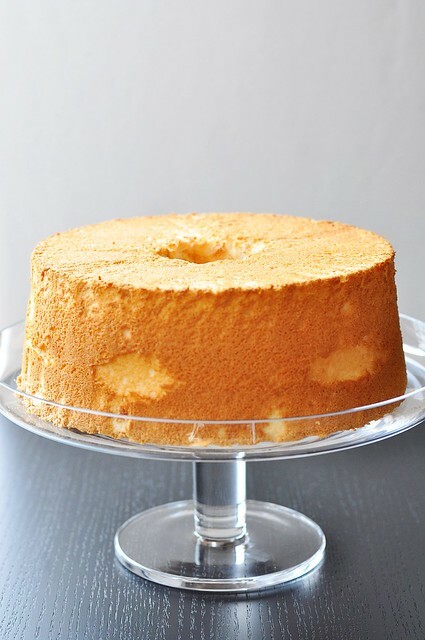 Angel Food Cake is a blank canvas. You can keep it simple by making it as written with vanilla extract or feel free to experiment with other flavorings. Almond extract would be great or you could add a teaspoon of citrus zest for a fresh twist. Place the egg whites, water, vanilla extract, and cream of tartar in a large bowl. Using an electric hand mixer, beat on low speed until the mixture is very frothy. Once frothy, increase the speed to medium and slowly add in the remaining 3/4 cup of sugar. Beat until medium peaks form (a peak will hold, but not stiffly). Sift or sprinkle a small amount of the flour mixture over the top of the beaten whites and fold to combine. Continue until all the flour has been incorporated. It will take several additions. Carefully pour the batter into an ungreased tube pan with removable bottom . Bake for 45 minutes. A toothpick inserted in the cake will come out clean when done. Invert the pan over a cooling rack and allow the cake to cool upside-down for at least an hour. Run a long, thin knife in between the wall of the pan and the cake, and also around the tube, to begin to release the cake from the pan. Pull out the tube/bottom insert with the cake attached. 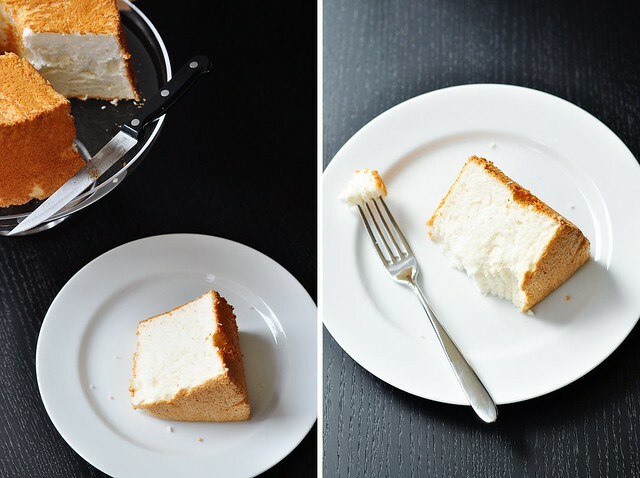 Run the knife between the cake and the bottom of the pan to release it the rest of the way. Carefully invert over a cake plate. The cake will fall away from the pan. To slice, use a sawing motion instead of downward pressure; Angel Food is delicate and this will keep it from smooshing down when being cut. 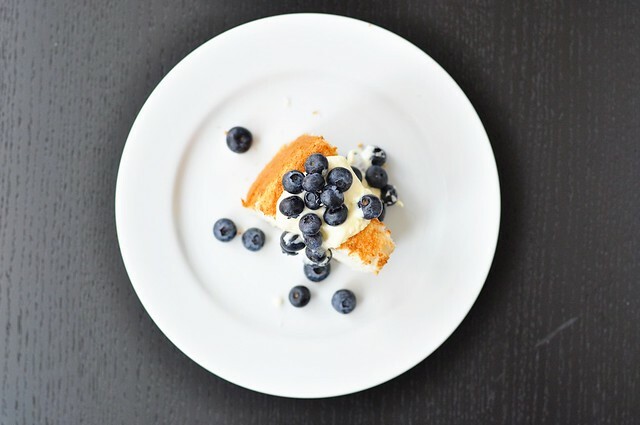 Serve unadorned or with creme fraiche or unsweetned whipped cream and berries. *If you’re worried about what to do with all those egg yolks, this site has a lot of good links to recipes requiring yolks only. I’ll also soon be showing you a recipe requiring 4 yolks and yet another requiring 6. Update: Also, you could use up 4 yolks in this Boston cream pie and another 6 in this 7-yolk pasta (the 7th yolk comes from a whole egg)! You can save your yolks in an airtight container in the fridge for a couple days or you can freeze them for up to a year (instructions for freezing here).